With the New Year just around the corner, it’s that time where everyone is getting pumped up to welcome 2019 with a bang. If you happen to be in Dubai then you already know that you’re in for a treat. There’s going to be some of the biggest New Year’s Eve parties in Dubai happening at the end of this year. If you wish to celebrate New Year on a high note then Dubai is the perfect destination for friends and families. These are some of the best places to visit and celebrate New Year’s Eve in Dubai for 2019. Celebrate New Year by dining as you sail along the Dubai Creek or the Dubai Marina on a dhow cruise. These traditional boats are well-built with modern technologies and are decorated with the perfect lighting effects. Enjoy a delicious cuisine with complimentary champagne and wine with soothing Arabian music as you welcome the New Year. You can also visit the upper deck to catch the fireworks show under the stars. The Dubai Creek is the older part of Dubai, and the scenery is of Dubai’s classical architecture, and fireworks from those buildings. In the Dubai Marina cruise, you get to the newly developed Marina area and fireworks. If you want to celebrate New Year’s Eve with a bit of tradition then visit the desert safari for a wonderful experience. Once you set out on Dubai’s desert, there are plenty of activities you can engage with. Activities like dune bashing, camel riding, henna designing, shisha smoking, belly dancing and many more. Separate yourself from the world and enjoy a delicious BBQ food and entertainment to welcome the New Year. Dubai is home to some of the best night and beach clubs it has to offer. If you’re a party freak, then these are some of the best New Year parties in the Dubai taking place at these locations. Welcome 2019 at Zero Gravity which is offering you some of the best and the biggest music artists like Jax Jones and Sigma. This place is one of the top New Year’s Eve party in Dubai. If you love electronic music then visit EL Chiringuito. Mayan Warrior will be hosting the New Year’s party here. MAD will be hosting new year party like never before by performance from some of the best international artists like AKON and others. Dubai hosts some of the best fireworks show in the world. Treat yourself with some amazing fireworks show from these popular landmarks. This magnificent skyline in Dubai offers some of the best fireworks show. There are plenty of landmarks to witness the fireworks like the Madinat Jumeirah and Jumeirah Beach. Make sure to visit the landmarks earlier before it gets too crowded. The fireworks display is telecasted live on television from the Burj Khalifa. Apart from television, Dubai Fountain, Al Manzil Plaza and guests staying on the hotel can witness the amazing fireworks show. 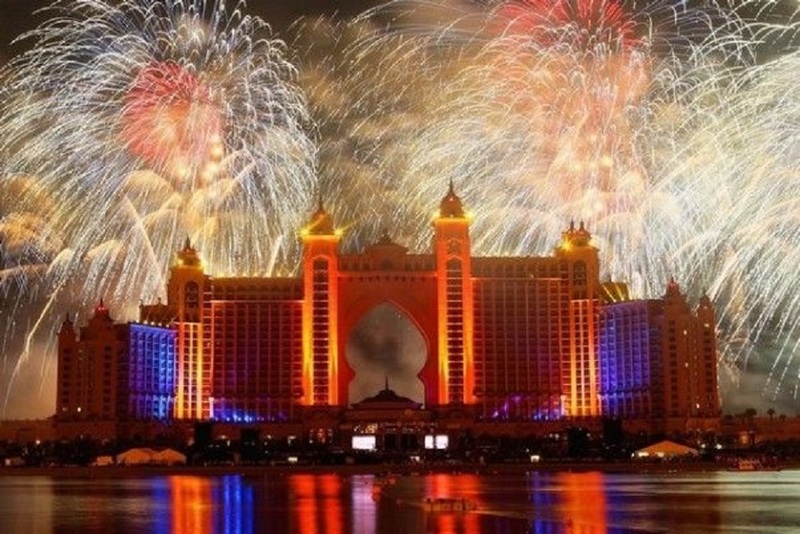 The Atlantis resort offers a unique fireworks display. Try to grab the front seats if possible to witness the amazing fireworks show. Spending New Year’s Eve in Dubai’s amazing restaurants is surely going to have a big impact. These are some of the restaurants to try out in Dubai. Celebrate New Year’s Eve in the most impressive way at The Atlantic. Open till 2am during New Year, the restaurant offers wide range of seafood along with beverages. The restaurant offers waterfront views of the famous Burj Khalifa and Dubai Opera allowing you to witness the fireworks as well. Located next to the Burj Khalifa along with indoor and outdoor seating, Carluccio’s offers some of the finest and tastiest European 4-course cuisine. Along with the food, there will be beverages served as well. This restaurant is known to offer the best views of the Burj Khalifa. Opened until 2am in the morning, there are beverages offered along with 5-course Asian meal. Located near the Soul Al Bahar, Serafina is known to offer Italian cuisine. The restaurant offers open bar along with upper and lower seating arrangement giving the chance to snap some great pictures. Enjoy watching the fireworks show from the tallest restaurant in the world. An open seating arrangement gives you the panoramic views of the city along with the mesmerizing fireworks show. Welcome 2019 with a bang by visiting some of the places mentioned. Get all the best New Year party deals from www.newyearpartydubai.com. How long cord blood can be stored?